"Student learns to play and play to learn for fun"
This programme is a regular weekly one-hour junior group lesson conducted at golf driving range. The programme is designed for junior golfer to enrich the specific knowledge, skills and attitude at golf Proficiency Certificate (PC) level. Our teaching methodology is by direct, indirect, demonstration and experiential learning to benefit each junior golfer of auditory, visual and kinesthetic modes of learning. The contents will break into manageable segment with order of increasing level of difficulties for skill learning. We will provide variety of challenging activities and game simulated plays for active and reinforce learning. The golf coach will be present to teach, motivate and impart the golf swing skills to the junior golfer. The life skills include but not limited to: awareness; self-esteem; assertiveness, coping with stress; coping with emotion; and social effective communication will be integrated in the teaching process for adaptive of positive behaviours. This is to promote a holistic learning. 1. To provide fun and safe learning environment. 2. To provide positive pastoral care, responsibility and motivation. 3. To provide constant guidance, supervision, feedback and learning opportunities. 4. To focus on positive character development, learning effort, skill performance excellence and enjoyment. 5. To assist the student maintaining and improving their golf proficiency playing skills. 6. To feedback to parent on their junior golfer's performance. The junior golfer learning outcome of this programme is: able to list the important golf safety rules; perform golf warm-up exercises within 8 minutes; refine and vary their performance of the golf swing technique; explain and demonstrate the condition, performance and standard of each specific golf technique's application; perform their golf shot proficiently; and prepare the body and mind confidently for their monthly 2 hours golf game. Junior golfer grows at different rates and their progress will varies. The Intermediate Junior golfer will be encouraged to participate in golf handicap competition when they achieved the golf competency. 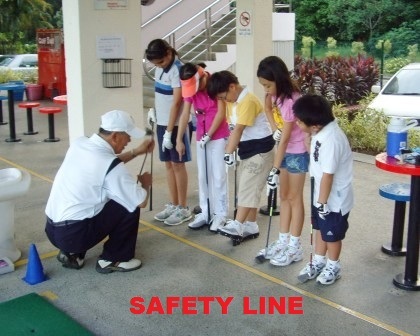 The Golf Safety and Lesson Rules are the MOST IMPORTANT requirement for golf learning. 1. Student learns to ensure nobody is near him or her when performing a golf swing. 2. Student learns the safety rules on the golf putting green. 3. Student learns to follow the safety line marked by the cones on golf chipping and pitching ground. 4. Student learns the importance of bring the water to the putting, chipping and pitching grounds. 5. Student learns the safety rules when playing in the golf sandbunker. 6. Student learns to improve their communication skills with their golf coach and classmates. 7. Student learns to play as a team for mini-games. 8. Student learns to exhibit sportsmanship during golf lessons and game performance. The golf swing static and dynamic exercises is the foundational aerobic skills to condition the Student's body for the adapting and refining of the golf swing technique. 1. Student learns to perform their warming up exercises diligently for the golf-specific skills. 2. Student learns to vary the intensity of the dynamic swing exercises to facilitate their golf swing technique performance. 3. Student learns to refine the postural stability for the golf swing technique. 4. Student learns to refine the dynamic postural balance for golf swing technique performance. 5. Student learns to refine the specific shoulders rotation for the golf swing technique. 6. Student learns to refine the specific body movement patterns for golf swing technique. 7. Student learns the body agility, flexibility and mobility for the dynamic golf swing action. 1. Student learns to formulate their self-concept of their specific golf swing action. 2. Student learns the ability to vary the intensity of the dynamic swing exercises for active learning. 3. Student learns what is mental and physical readiness for the swing technique performances for active learning. The golf swing technique posture is a preliminary movement required for all golf swing technique. It accounted to 80 percent of the golf technique performance efficiency. 1. Student learns what is the correct 'Address Position' for a golf swing skill? 2. Student learns to adapt the correct feet standing position. 3. Student learns to adapt the correct spine tilting angle. 4. Student learns to adapt the correct knee bending position. 5. Student learns to adapt the correct body weight distribution on the feet at 'Address Position'. 6. Student learns how to hold the club correctly with the correct fingers tension. 7. Student learns to adapt the correct position of the arms, golf clubface and golf ball at 'Address Position'. 1. Student learns the important skills of relaxation and concentration for a golf swing technique performance. 2. Student learns to formulate their self-concept of a golf swing technique posture. 3. Student learns to describe their physical set-up of a golf posture. The golf arm-swing technique is an essential golf swing skill for the Student. It is horizontal transfer learning skill for the golf chipping, pitching and sandbunker technique. 1. Student learns to refine golf backswing and downswing movement for the golf arm-swing technique. 2. Student learns to refine the follow-through swing action for the golf arm-swing technique. 3. Student learns to refine the lower and upper body' movements for an efficient golf swing action. 4. Student learns to refine the shoulders rotation for an efficient golf swing action. 5. Student learns to vary wrists flexion and extension movements for the golf arm-swing technique. 6. Student learns to refine tempo and rhythm for the arm-swing technique. 7. Student learns to refine their optimum golf ball striking ability. 8. Student learns the names of the golf ball flight performance. 1. Student learns to set goal for their golf arm-swing technique performance. 2. Student learns the visual modalities for the golf arm-swing technique performance. 3. Student learns the ability to repeat their correct golf ball flight performance for active learning. A Student must know how to perform the golf iron full-swing technique within their physical and athletic ability. Different golf iron clubs is designed to produce different golf ball flight performances. The goal is the ability to propel a golf ball accurately to various distance targets on the golf course. This is a proficient golf swing skill. 1. Student learns to refine the backswing, downswing movement for the golf iron full-arm swing technique. 2. Student learns to refine the follow-through and finish-swing for the golf iron full-arm swing technique. 3. Student learns to vary the wrists flexion and extension movements for the golf iron full-arm golf swing movement. 4. Student learns to vary their intensity for golf iron full-swing dynamic performance. 5. Student learns to refine the body weight-transfer during a golf swing technique performance. 6. Student learns to refine the lower and upper body' movements and an efficient golf swing action. 7. Student learns to adapt the esthetic of the golf iron full-swing technique performance. 1. Student learns what is 'goal setting' for their golf shot performance. 2. Student learns what and how to perform the pre-shot routine? 3. Student learns what is 'Attentional Control' for the golf iron full-swing technique performance. 4. Student learns what is 'Internal and External feedback' of the their golf technique performance. 5. Student learns the challenge to repeat their optimum golf ball flight performance for active learning. 6. Student learns to assess their golf shot performance for active learning. The golf driver swing technique is an important golf swing skill for Student to hit the golf ball to farthest distance on the fairway accurately within their physical and athletic ability. 1. Student learns to refine the golf posture for the golf driver swing technique. 2. Student learns to vary golf ball position at 'Address Position'. 4. Student learns to refine and vary the backswing, downswing, follow-through and finish-swing for the golf driver swing technique. 5. Student learns to refine and vary the lower and upper body' movements and an efficient golf driver swing action. 6. Student learns to refine the dynamic swing movement of the arms and hands to lead the golf swing action. 7. Student learns to refine the dynamic golf swing rhythm and timing for the driver swing technique. 8. Student learns to adapt the esthetic of the golf driver swing technique performance. 1. Student learns what is 'Attentional Control' in golf psychology and the application for the golf driver swing technique performance. 3. Student learns the challenge to repeat their optimum golf ball flight performance for active learning. 4. Student learns to assess and evaluate their golf shot performance for active learning. The golf putting swing technique is for Student to hit and roll the golf ball accurately into the hole on the putting green. This is the most challenging skill as every putting green on the golf course is uniquely designed. The goal is to get the golf ball into the hole with least number of strokes. 1. Student learns the importance of the golf putting technique performance for the game. 2. Student learns to refine and vary golf posture setup for the golf putting technique. 3. Student learns to refine the arms and hands position at 'Address Position'. 4. Student learns to vary the hands, fingers tension for the golf putting technique. 5. Student learns to refine the backswing (take away), downswing and follow through of an efficient putting stroke. 6. Student learns to vary the intensity for the single stroke pendulum swing movement. 7. Student learns how to execute short and long putts accurately. 1. Student learns the 'goal setting' for a golf putting swing technique performance. 3. Student learns to refine the visual-perceptual skill of golf ball alignment to the hole. 4. Student learns to play line and ladder drills with increasing challenge for active learning. 5. Student plays '2-putt game' for active learning. The golf chipping and pitching swing technique are play outside the putting green. A Student should know how to perform an efficient arm-swing skill to propel the golf ball toward the target on the putting green. The performance outcome is to get the golf ball to stop near to the hole on the putting green. 1. Student learns the importance of golf chipping and pitching shot performances for the golf game. 2. Student learns to how to describe a chipping and pitching shot performance for the golf game. 3. Student learns the condition and standard of performance required for the golf chipping and pitching technique. 4. Student learns to refine the golf posture setup the golf chipping and pitching technique. 5. Student learns to refine correct golf ball position for optimum impact by the clubface. 6. Student learns to vary the correct lower and upper body movement for the golf chipping and pitching technique. 7. Student learns to refine correct hands and arms movement for the golf chipping and pitching technique. 8. Student learns to refine and vary of follow-through swing action for an accurate golf shot performance. 1. Student learns the 'goal setting' for the golf chipping and pitching shot performances. 2. Student learns to develop the visual perception skill of the correct body alignment for the golf chipping and pitching swing technique. 3. Student learns what and how to perform their pre-shot routine for active learning? 4. Student plays line and ladder drills golf chipping and pitching games for active learning. The golf greenside sandbunker swing technique is to challenge the Student shot-making proficiency, the golf ball is plays on the sand. 1. Student learns the importance of the golf sandbunker shot performance for the game. 2. Student learns the standard of the sandbunker shot performance for the game. 3. Student learns to refine the golf posture setup for the golf sandbunker swing technique. 4. Student learns to vary the golf ball position at 'Address Position'. 5. Student learns where is 'the point of impact on the sand behind the golf ball for the clubface to strike? 6. Student learns to refine and vary the arms and hands dynamic swing action. 7. Student learns to vary the follow-through swing action. 1. Student learns the 'goal setting' for the golf sandbunker swing technique performance. 2. Student learns the visual perception skill of body alignment in the sandbunker. 4. Student plays line drill games for active learning. 5. Student learns to assess their golf shot performance for active learning. Junior Golf Intermediate Programme 2 regular refinement lessons require repetition of golf swing knowledge, skill and attitude instructions. We provide constant guidance, supervision, feedback and opportunity for the junior golfer to perform their golf swing technique as proficient as they should be. Junior golfer are to perform all the golf swing skills within their physical and athlete ability. Adult may takes many months to master all the golf swing technique. Our primary goal is assisting the junior golfer to achieve the sense of accomplishment of the golf technique's proficiency for the golf game. The distance of the ball flight performance is a secondary goal base on the individual physical and athletic ability performance. There will be golf swing proficiency assessment and evaluation on junior golfer's individual attitude and aptitude during the lessons and golf game. The performance progress will be feedback to parents. Junior Golf Immediate Programme 2. Junior group and one-to-one coaching. One (1) hour weekly regular lesson. Four (4) students, maximum five (5) students per coach at the range. 6 to 18 months to achieve Golf Handicap Index level. Singapore Golf Association (SGA) Handicap Index for Inter-school Golf Competition. Student is required to use their golf equipment and wear proper golf attire for lessons. Student is required to purchase the practice range golf balls for their golf swing technique practices during lessons. medical conditions and any important information that parent think is essential for the Teaching Professional to know. Role of Parents: Parent is required to sign the Guideline by Singapore Ministry of Education and Singapore Sports Council. Letter of Indemnity: Parent is required to sign the Letter of Indemnity for the Junior regular golf lesson. Student is required to come in golf attire. Golf shoe, collar T-shirt and proper short or pant. We are currently organising regular weekdays junior golfer group lessons. Please call us for update. the golf posture setup; how to hold the golf club; arm swing skill and experience the lesson's requirement. We need	the student to acknowledge that he or she will like to learn and play golf before joining the group lessons. The fee for this one time one-to-one lesson is $90.00 per Student. Programme Fee; Cost of range practice balls; and Fee for usage of other training grounds. Fee for year 2019 junior group lesson is $160.00 per month for four (4) weekend lessons per student. If there is five (5) weekend lessons in the month the programme fee is $200.00 per student. When lesson is conducted at the sheltered range, student is required to purchase the practice range golf balls for their golf swing technique practices. Currently the cost is $2.40 for 40 practice balls by Cash Card. We will provide F.O.C. practice golf balls for putting, chipping and sandbunker lessons only. Fee for year 2019 is $360.00 per month for four (4) weekend lessons per student. If there is five (5) weekends in the month the programme fee is $540.00 per student. Currently we do not have weekday junior group lesson. Please call for coaching fee if you have two (2) or more junior wanting to sign up for regular weekdays lesson. Fee for year 2019 is $280.00 per month for four (4) weekday lessons per student. If there is five (5) weekends in the month the programme fee is $350.00 per student. In Singapore dollars nett. No Goods and Services Tax (GST). Advance full month programme fee payment in cash, cheque or Internet Banking transfer only. Programme fee is non-refundable and non-transferable in any event that the participant could not complete the agreed lessons of the month.